An example of finger stretching in the MIRAGE. Figure taken from Preston and Newport (2011)Rheumatology. MIRAGE (short for Mirrors and Genius) is a sort of ‘magic hand box’ that allows people to see and feel their own hands being physically distorted or apparently moving under alien control. Illusions range from giving people stretchy fingers to making one hand disappear. Artificial manipulation of the body image is important for understanding how the brain makes sense of our body and has the potential to be used in the reduction of chronic pain. It can also tell us how we adapt to bodily changes due to ageing or injury (i.e. amputation and paralysis) and whether the brain treats tools as part of the body. MIRAGE works as a virtual reality device that uses a system of cameras and mirrors allows the viewer to see a real-time video image of their own hand in the same location as their actual hand. 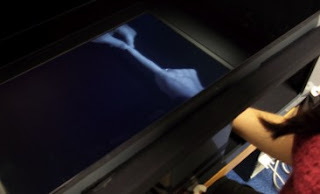 At the same time, instantaneous digital manipulations to the visual input, coupled with proprioceptive and tactile manipulations give rise to a range of bodily illusions from hand stretching or swapping to hands that disappear from vision and touch. The most recent scientific application of this device has shown that manipulating the seen and felt size of the affected joints in arthritis can temporarily reduce, or even eliminate, pain. Other applications have shown that the brain can sustain multiple (supernumerary) limbs and that it can be fooled into treating your own hand as not belonging to you or being under your control. MIRAGE research can help us to understand issues as diverse as normal and abnormal body ownership, movement agency, mechanisms of everyday reaching for objects, sensitivity to touch and pain, and visuo-motor adaptation. Each of these areas is covered in a separate section below.